Docstoc Premium is a free Document Templates Windows 8 app available under the ‘Productivity’ category of Windows 8 Store. Here, in this Windows 8 Document Templates app, you can find over 20,000 best quality professional document templates, guides, videos, articles, forms, and other resources for both business and personal requirements. The templates have been divided into several categories such as Starting and Forming a Business, Human Resources, Marketing, Finance and Investment, Bookkeeping, Account & Tax, Personal Legal, Job Search, and many many more. And in these categories you can find resume templates, resignation letter templates, invoice templates, Cash Flow budget worksheet, generic balance sheet, depreciation worksheet, partnership agreement form, Lease agreement, iPhone apps contract, IT Job estimate form, web hosting agreement, investment agreement, medical power of attorney, notice to pay rent or quit, Indemnity, and the like. It’s a big list. You have to go through the app to view more and more. However, let me mention it here that the downloading of templates is not free, you have to pay for getting the templates. Apart from document templates, Docstoc Premium also provides videos related to each category where experts speak up about various topics such as 10 Questions For a New Business, How To start a Company, Tips to tackle you tough projects, 2 mistakes in document management, Structuring a Board of directors, Tools to track business expenses, How to build up relationships with investors, and many more. The list is really very long. In addition, this document templates Windows app, you can also find a number of articles that help you in various areas of your life. Topic such as Common Startup Financial Mistakes, 7 Things To Know Before Starting a Business, Understanding Power Of Attorney, How To Write a Will, Writing Cover Letters, Salary Negotiable Tips, Best Careers For Working Mothers, Body Language & Business Etiquettes, 6 Ways To Prepare For Retirement, and many more are included in the list. As you open the app you will find a big HD screen including all the categories. Now, to browse around all the categories, you need to scroll towards right by using mouse wheel or by using the horizontal bar. Choose a category from where you want to download a document and click over it ? this will bring you a number of different related documents ? select the one you want ? this will quickly open the document along with its description in brief ? click on ‘Download’ button (right-click anywhere on the screen to open the download button inside the horizontal bar). Now, as you click on the ‘Download’ button, it will ask you to select a plan you want to take. Yup.. it’s not free as mentioned above. For downloading templates, you need to play a small amount. Hence, just fill in the details and get it right now. Press ‘Win+Q’ to let the search bar opened. Type the name i.e Docstoc Premium in the box and press Enter key. Soon the app will be in front of you. Open it. Click on ‘Install’ button to get it now. There you are.. start using it. 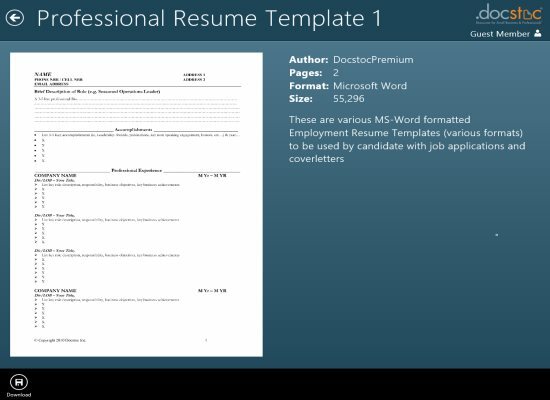 In short, Docstoc Premium is a good utility document templates app to get templates of any and every docs required to start a business, to end a business, resumes, iPhone apps contract, Lease agreement, and more.